Boaters know how crucial safe drinking water is when cruising. In developed countries, dockside water is safely treated, and bottled water is readily available. Even so, without rigorous and regular care, your pipes and hoses can pass sediment through to your faucets, allowing algae and bacteria to grow. The right marine water filter can help, and using a sediment filter on a boat is one of the most practical ways to maintain fresh, pure water for drinking. Choosing a good sediment water filter will help keep your drinking water tasting fresh and pure, ensuring you and your passengers don’t get sick. 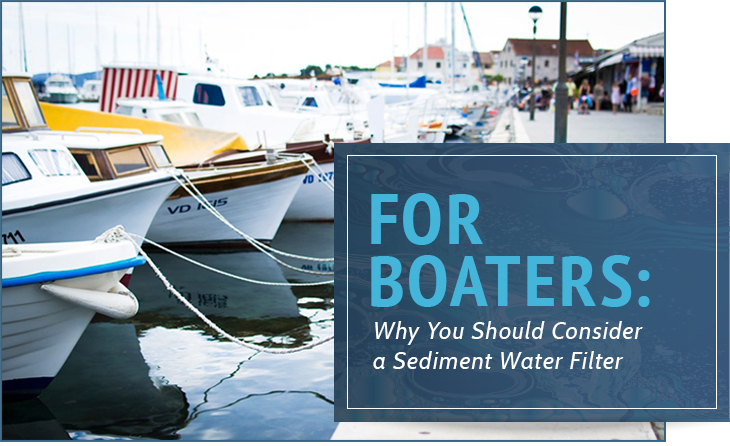 Using a sediment filter is a vital component — probably one of the most critical parts — of keeping your water pure and safe on a boat. Most of the time, boaters place a filtration system between the water tank and the tap. However, you want to remove as much sediment as possible before the water reaches your storage tanks. Catching the sediment upstream will prevent it from clogging your hoses and pipes and fouling your tank. Choose a filter that does not slow down the flow too much, or it may be impractical. For example, installing a very fine filter at the hose connection will slow down the dockside procedures, causing unreasonable delays for other boaters. It will also create delays when you are in a hurry to cast off. Keeping your storage tank clean is one of the most important parts of maintaining a sanitary water supply aboard your vessel. Dirt, scale sediment, and algae can quickly build up in your tanks despite any precautions you take. Although a good sediment filter can remove any buildup before it gets to the faucets, keeping your tank as sanitary as possible will help prolong the life of your filters and provide another layer of protection to keep your drinking water pure. Keeping a tank clean requires several regular maintenance procedures. You must periodically drain and dry your tanks. Consider doing this at least once a year so you flush out any biomass, dirt, insects, or anything else that may have accumulated in the tank. Fill your pipes with a bacteriostatic fluid to clean out any bacteria buildup. In a cold climate, don’t use a diluted fluid or it may ferment and create an unpleasant odor or mass buildup. For warm environments, you can blow out the lines with compressed air. Many boats use chlorine to help kill bacteria and prevent algae growth in the water tank. Chlorine does not taste very good. The chemical also can create problems in the galley, as chlorine kills the yeast in bread and yogurts, for example. Even unchlorinated water often tastes terrible. The chemicals in the pipes and the plastic taste that may result from using a plastic water tank contribute to the taste of your water. A good filter will remove the microscopic particles that cause this. Rainwater contains all sorts of impurities. Drops of rain include dust particles, suspended hydrocarbons like soot, and various dissolved gasses. You may also get other chemicals and larger particulate matter contaminating your water supply depending on your rain catching system. No matter how tight you seal your water tank, bugs like sand flies inevitably get into your tank. They die and accumulate in the bottom. Think of a sediment filter as a type of net. Water passes through it, and anything too substantial to pass through the holes in the net or filter gets trapped. Some very large commercial sediment filters have a backwash function that removes the trapped particulate matter by reversing the flow of water and rinsing the particles down the drain. However, for boaters and most other users, disposable cartridge filters or filters you can clean and reuse are sufficient. Filter manufacturers use a standard micron scale to rate how effective a filter is at removing particulate matter. A micron is extremely small. The width of a human hair is about 90 microns. Many sediment filters are designed to trap impurities that are 1/300th the size of a human hair. Beach sand runs between 100-2,000 microns, bacteria three microns, and lead dust about two microns. Viruses can be as small as .005 or as large as .3 microns. Many sediment filters are rated at 1 micron and will catch 99.9 percent of bacteria and larger particles. In addition to the micron rating, the filter marking may state whether it is nominal or absolute. The Water Quality Association (WQA) rates a filter as nominal if it can filter out 85 percent of the particles based on the micron rating. An absolute micron rating means the filter can remove 99.9 percent of the impurity. Although the WQA promotes these definitions, no domestic or international agency enforces the use of this standard. Some manufacturers use a lower threshold for labeling their product nominal. For example, if a filter can catch 75 percent of the particulate matter based on its micron rating, it could be marked nominal. 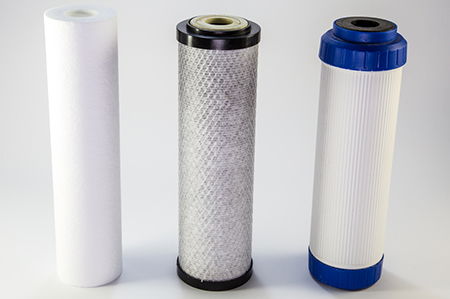 A sediment filter cartridge is either a surface, depth, or adsorptive filter. The adsorptive filter has increased in popularity recently. Each one filters slightly differently. Surface or pleated filters have a thin sheet that traps particles before they reach the other side. Pleated filters have more surface area than a depth filter. This provides a greater capacity to filter uniform-sized particles. It is much easier to manufacture a pleated filter to a very specific micron rating. Surface filters can also be cleaned and reused. A depth filter has filter material, like charcoal, that the water must pass through and that traps the particulates. Depth filters also often use a graded density format. As the water passes through the filter material, the density of the material increases, allowing the filter to trap smaller particles the deeper the water goes through the filter. Ceramic depth filters often have absolute ratings due to the density of the ceramic used to trap the contaminants. The most common type of depth filter is the wound-string or melt blown version. Many use depth filters when the material filtered varies a lot. Adsorptive filters come in pleated or depth form. Most rely on a process known as electro-kinetic adsorption (hence the name). This permits the filters to trap much smaller matter than regular filters can trap by attracting negatively charged microorganisms and colloidal matter. Colloidal matter is matter that is between 1-1,000 nanometers in diameter. A key advantage of the adsorptive filter is that, while it might have a two-micron rating, it can attract and keep out colloidal material much smaller than two microns. One method for some systems is using more than one filter. For example, you could use a wound string sediment filter as a pre-filter to catch the larger pieces of debris and dirt, then use another sediment filter — a surface or depth filter — to further cleanse the water. On a boat, you have three broad classes of filtering: tap, Seagull-type, and standard plumbing filtering. The type of boat you have and where you intend to sail will dictate the best class of filtering system for you. 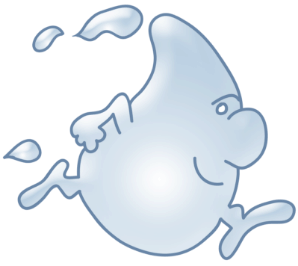 A tap filter works right after or at the tap, just like many home filtering systems. For some tap filters, the filter works as the water flows into a pitcher or bottle. Tap filters work well to remove chlorine or similar chemicals that make the water taste bad. They wear out quickly, however, especially when filtering a lot of sediment. These filters are usually good for 20-40 gallons. A Seagull filter is a brand name of a filter system made for boats by General Ecology. Like Kleenex, Seagull has become synonymous with any manufacturer that makes this class of microbiological system. These filtering systems meet EPA guidelines for removing bacteria, cysts, and viruses. Mostly, they come with a dedicated faucet. Other companies make seagull systems with independent verifications that the filtering meets EPA standards for microbiological. NOTE: Microbiological filters do not use a standard housing size. They use a five-inch-long, five-inches-in diameter housing. These are the most common types of filtering systems. 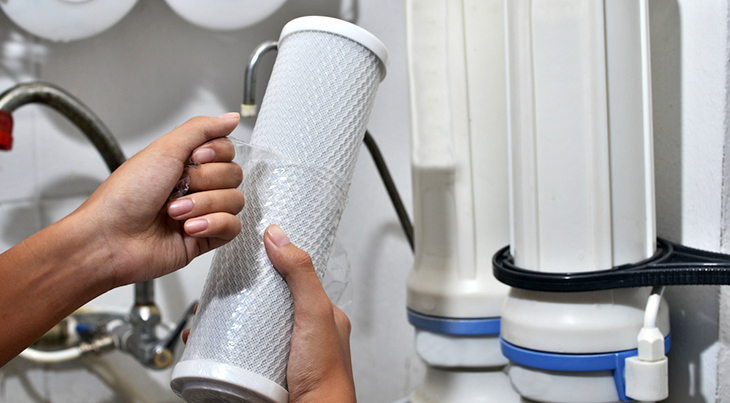 Readily available, standard plumbing filters come in surface, depth, or adsorptive types. They also come in standard sizes and are used everywhere in the world. You can find assorted styles of marine water filters to suit your craft’s and your personal needs. These make excellent filters for a craft that doesn’t stray too far from the home port where it is easy and simple to stock up on water regularly. These filters are generally light-weight, inexpensive, and compact. The filtration media general is granular activated carbon (GAC), KDF (Kinetic Degradation Fluxion) or a combination GAC/KDF filter. Granular activated carbon filters are made for removing organic chemicals that cause water to smell or taste funny. Compounds like chlorine or hydrogen sulfide, which gives water a rotten-egg odor, are the types of organic chemicals GACs filter. Certain other types of chemicals, such as iron and nitrate, are not removed by GAC filters. GAC filters are often called charcoal filters. This is because they are made from raw organic materials like coal or coconut shells. Kinetic Degradation Fluxion uses a copper-zinc filtration media that removes the contaminants through a redox, which eliminates the oxygen. Like a GAC filter, a KDF will remove chlorine and hydrogen sulfide. It also removes lead, mercury, and iron. Neither a GAC nor a KDF can remove all the chlorine if you use these filters as a hose filter when filling your tank. Full-flow, your tank fills at about four to seven gallons per minute. This removes only 15 to 35 percent of the chlorine. However, if you use one of these filters at a tap, where the flow is about one gallon per minute, the filters remove most of the chlorine. A string wound filter is a type of water sediment filter that has a high capacity for holding dirt and debris. Constructed of one piece, manufacturers use a high-speed continuous wind process. You can find these in various lengths and degrees of porousness. A polyspun filter has a reputation of lasting longer than a string wound filter. Polyspun filters cost less too, but they are not reusable. Carbon block filters are very powerful GAC filters. Some have .5-micron ratings that will filter common water-borne bacteria like giardia and cryptosporidium that cause severe diarrhea. These also filter 99.9 percent of the chlorine. 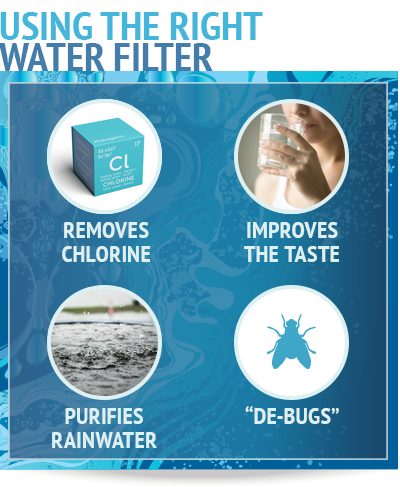 These are great filters, but they can be quickly blocked and need frequent replacement if they are the primary filter also used to remove dirt and sediment. These filters will only remove small concentrations of heavy metals and can quickly be overwhelmed with a heavy accumulation of these metals. This media does very well in filtering out arsenic, fluoride, and silica. Birm is a plastic with a magnesium oxide coating. It removes iron and manganese particulates very well. Calcite is crushed marble or calcium carbonate. If the water is too acidic, the calcite eventually reaches a neutral PH level. Zeolite is a naturally occurring substance mined mostly in the western United States. It has a micron rating of less than five and can be backwashed, if you use filters with a backwash function. Some filters combine the stopping power of several distinct kinds of media, such as garnet and gravel. Most housings are 10 inches by 2 ½ inches in diameter. The filters run about 9 ¾ inches, so they fit snuggly in the case.